The Holy See determined the Pope to be was the Vicar of Christ, as the substitute of Christ, therefore a representation of god on Earth, and through that authority was claimed ownership of the earth in its entirety. States are granted ownership through the authority of the Pope, there is no other basis or rational of the fraud of ownership. In 909 AD the Carolingians became the Monastic order and formed the system of Feudalism they then planted upon the Isles of Briton to replace the old Allodial system. 1066 was the removal of Man in the image of God, to the lowly masses, ownership would now be in the hands of the Roman empire. Once ownership is established the constructed fictions of a legal positive law model can be imposed on the slaves upon the land, known as serfs, later renamed humans. The policy of the landlords then applies upon that which is owned. The legal system is based wholly upon constructed fictions, such as corporation, trust, state and instruments, etc. It is a constructive system not a substantive one. In property law, allodial title is a concept describing a situation wherein in land, buildings, fixtures or any other real property is owned for the cost of nothing and free from any financial burdens including tax, mortgage and liens. A property with an allodial title is inalienable, it is an absolute property of its owner and is not subject to any law and authority. This means that it cannot be taken for any reason whatsoever by any operation of law. Biblical Man is allodial. Absolute property ownership Property owned under true allodial title is very rare to find. Countries like UK, the US, Canada, Ireland and Australia describes allodial title as being fee simple an absolute ownership right limited by four government powers of taxation, police power, eminent domain and escheat. So basically, you will seldom find a property under allodial title, but they are to be found. 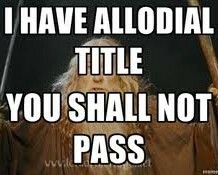 allodium, ( all’t : full property) land freely held, without obligation of service to any overlord. Allodial land tenure was of particular significance in western Europe during the Middle Ages, when most land was held by feudal tenure. At the end of the 9th century the extent of allodial land in France was increased by the anarchy that accompanied the decline of the Carolingian monarchy; much of this new property, however, was eventually brought into a feudal relationship in which the holder owed certain services to his lord. By the 12th and 13th centuries, the only appreciable amount of allodial land remaining was limited to peasant holdings in the Southwest. In Germany large allodial estates held by nobles continued to exist, particularly in Saxony. In England there was a considerable amount of allodial land before the Norman Conquest (1066), but it disappeared under the new rulers. Allodial land, though free of limitations from above, was not free of restrictions from below if the holder chose to have feudal tenants. He would then owe certain obligations to them, primarily in terms of protection, and could not be considered in absolute control of his holdings. With the decline of feudalism in France, land that had been under the jurisdiction of a lord came to be under the jurisdiction of the king, who collected certain fees upon its sale or transfer. Following the French Revolution (1789) all land became allodial. In England no land is referred to as allodial, but an estate in fee simple corresponds in practice to absolute ownership. Feudal land tenure (economic system) System by which land was held by tenants from lords. Freehold (law) In English law, ownership of a substantial interest in land held for an indefinite period of time.